South Carolina blogger Anne Wolfe Postic has strong feelings about pimiento cheese. I have a confession. I was 24 when I first tried pimiento cheese. And I grew up in the South. I was in the hospital for the birth of our first child, and I was hungry. A nurse brought a pimiento cheese sandwich like one of the ones you get out of a machine, a smear of mealy orange cheese spread peppered with pimientos between two slices of thin, ever so slightly stale white bread. I was skeptical, but hungry in the manner of someone who has just had a baby and hasn't eaten in a while. In other words, I would have eaten anything. That sandwich was gone in four bites, and I was hooked. Who knows why I had never tried pimiento cheese? Maybe I thought it was an adult food, like scotch (which I still don't like). Or maybe it was all the time I spent up north at school. But on that day, I found the love of my life. The kid turned out pretty well, too. Pimiento cheese is practically a religion in the South, maybe even more so in my hometown of Columbia, South Carolina, where we claim to have invented the pimiento cheeseburger. This is an honor that I’m proud of, even if it does seem like a no-brainer. If you're aware of the existence of both pimiento cheese and cheese burgers, why wouldn't you combine the two? Here in Columbia, we like it on fried green tomatoes or hot pita chips from DiPrato's, in omelets, on crêpes (don't blame me—my husband is half-French), on crusty bread with thick slices of summer tomato, on crackers with a little jam, or on a spoon, straight out of the bowl. We eat it on celery sticks, potato chips, and Mr. Friendly's steak. I add it to quiche, tomato pie, and my mother's mac and cheese (and skip the Duke's mayo, because pimiento cheese has that covered). We eat it while tailgating, and we eat it for lunch on Tuesday. We serve it at cocktail parties, and we eat it on Christmas. We eat it at black tie events and in our pajamas. 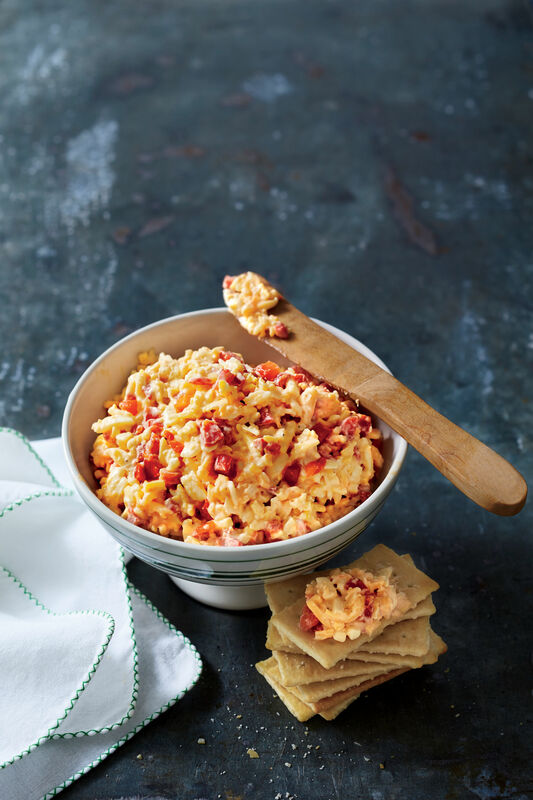 In other words, however you want to eat pimiento cheese, we're okay with it. In October, when we travel to Sewanee for an annual family weekend, you can be sure I'll have homemade pimiento cheese in the cooler—because no matter how old they get, every child needs a taste of home. Besides, my pimiento cheese is famous. What's that? Yours is, too? And your Aunt Jean's? Well, that may be, but I'm sure mine is the best. Kidding. In my opinion, all pimiento cheese is a treasure, and we need to stop limiting it with our absolutes. While your cousin's splash of olive juice may make hers the ultimate pimiento cheese, I could argue that a dash of spicy Dijon is the most important ingredient. At Rosewood Market in Columbia, where they make a darn fine pimiento cheese, I was surprised to learn that their secret ingredient was...wait for it...vegenaise. And Aunt Jean swears by Dromedary brand pimientos. Guess what. They are all delicious. My recipe varies, even though I always keep a few of the same elements—there are just some trusty essentials I believe in when it comes to pimiento cheese.